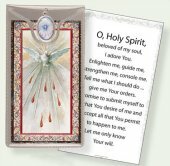 DIVINE CHRISTIAN GIFTS - Silver Foil Confirmation Medal & Prayer Card. Silver Foil Confirmation Medal & Prayer Card. Silver foil stamped Confirmation leaflet with medal prayer card.